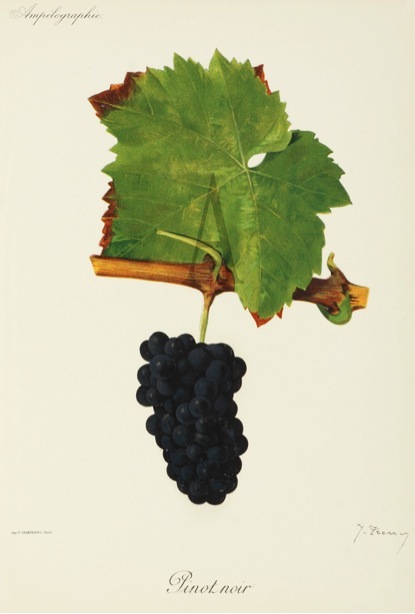 J. Troncy lithograph of Pinot Noir - the mystical grape. Ever since Matt Kramer (contributing editor to Wine Spectator) offered his keynote speech at the Pinot Noir 2013 conference in Wellington last month, wine writers have been debating the roles that clonal selection, planting and viticultural management play in the making of outstanding Pinot Noir wines. I have been following with great interest the related coverage on several blogs, including posts written by Jamie Goode and Alder Yarrow, both of whom go into some detail regarding Kramer’s recommendations to use multiple clones and selections of Pinot Noir to create truly great wines. “Recently I gave a speech at a Pinot Noir conference in Wellington, New Zealand. Without going into the various details of my talk, suffice it to say that I offered the suggestion that for producers to create really exceptional Pinot Noir—the truly great stuff—they might want to seek to make 2 + 2 = 5. Well, it’s very true, New World wines are “clone poor,” but Kramer’s criticism is somewhat disingenuous, for he overlooks the complexities – and risks – involved in vine importation and DIY clonal selection. The New World, let us remember, started out with no clones of Pinot Noir. Thus, each importation adds to a country’s germplasm “treasury” – surely a process that can only benefit Kramer’s goal of producing exceptional Pinot Noir. The fact that New Zealand, Australia and the US are now making Pinot Noir in which 2 + 2 = 4 is remarkable in itself, given that our production has a heritage lasting only a few decades, as opposed to a few centuries. Burgundy is the natural home for clonal selection of Pinot Noir and, in contrast to selections for other varieties, the process has engaged viticulturists and winemakers for a very long time indeed. From source selection to registration is a very lengthy process: a minimum of 12 to 15 years is required before ENTAV presents a new clone to the French Ministry of Agriculture for approval, and during that time the vines are put through lengthy sanitary, viticultural and winemaking trials. Today, biosecurity regulations govern vine importations in most countries, making it no easy feat to finance and manage a vine’s two- to three-year quarantine period and the rigorous laboratory testing required before propagation and commercial distribution can begin. As a result, vine importation programmes are often managed by industry agencies or large nurseries (here in New Zealand, for example, Riversun Nursery is the sole licensee for ENTAV clones). The days when an individual winemaker could visit a vineyard in Burgundy and personally make a selection that he would then import privately are virtually over. Serious plant breeders no longer operate on such a limited basis, and the costs alone make sense only for large-scale operations, such as the UC Davis Foundation Plant Services programme. One of the highest costs comprises the laboratory testing required to ensure that vines don’t inadvertently arrive with pests and diseases carrying the potential to devastate the national vineyard. This, too, slows down the process of enriching New World germplasm. Speaking of disease, the New World already faces several challenges inherited from original importations from the Old World, including Grapevine Leafroll-associated Virus 3 (or Leafroll 3, for short). Leafroll 3 is particularly destructive on Pinot Noir, reducing yields, flavours and colours and delaying ripening. Let’s examine how that affects the process of sélection massale. In France, mass selection (MS) simply refers to a large amount of unselected non-clonal material that has not yet been formally assessed for any viticultural or oenological properties, but is known to be to be true to type. Hence, mass-selected Pinot Noir is used to make selections from – it is not necessarily selected to any criteria itself, except as being true to the variety. Mass selection is used as a genetic storehouse, and as such, it is carefully looked after by government agencies, both federal and regional. It is the base material from which new clonal selections will be made. Many French winegrowers have their own stocks of MS, from which they make their own private selections, which then form a part of their producing vineyards (Kramer’s recipe for making 2 + 2 = 5). This practice, however, is actually declining in France, as old vines succumb to disease pressure and modern viticulturists reach for demonstrably superior clones. A pity? Perhaps, in Kramer’s scheme of things, but vine health plays an essential role in making wines of quality. There are also risks associated with vineyard selection and propagation – the most important being the potential spread of diseases such as Leafroll 3. This is one of the reasons why clonal selection in general is undertaken on a relatively limited basis in the New World. Growers and viticulturists have already experienced the downside of disease spread (often from early planting material distributed before modern diagnostics were available to detect threats to vine health). Instead, they are increasingly reaching for vines that come with a “warrant of fitness” such as the New Zealand Winegrowers Grafted Grapevine Standard. Once again, the costs of complying with such a standard only really make sense for large-scale operations. So, where does that leave us? In New Zealand, the existing germplasm of Pinot Noir must easily reach beyond the 20 selections Kramer regards as preferable. Importations from the 1960s through to the present day might yield only a baker’s dozen of classified clones, but that doesn’t take Mother Nature into account. Since nurseries in the past often used different vineyards to source their material, that means that the 10/5 selected by one nursery might be slightly different from the 10/5 selected by another. 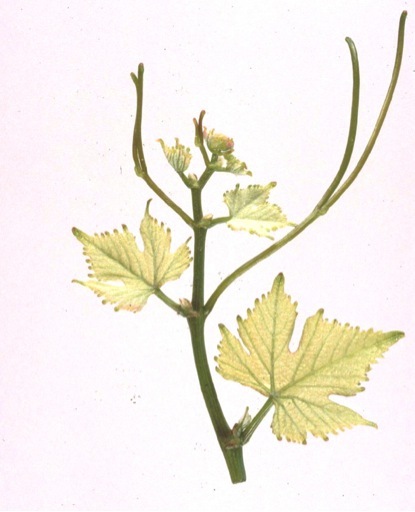 And some clones carry multiple profiles for parameters like vine and bunch architecture, suggesting that either there’s been a mix-up in the selection process somewhere along the way or that genetic mutation has occurred over time (and, let us remember, Pinot Noir is one of the most genetically unstable varieties). Then there’s the “Abel” clone (also known as the Ata Rangi clone), which comes with its own colourful and uniquely New Zealand pedigree. To learn more about the clones already in use in New Zealand Pinot Noir, you can’t go wrong with a short guide prepared by Riversun Nursery, “Clones of Classic Varieties: The Pinot Noir Portfolio” (or visit the Riversun Library to see their many other useful guides). Prepared by Geoff Thorpe (managing director) and Nick Hoskins (company viticulturist), the guide takes you on a tour of Kiwi vine importations over the years. Indeed, Nick (who once provided the viticultural expertise to winemaker Larry McKenna’s pioneering efforts with the variety at Martinborough Vineyard) knows just about everything there is to know on this subject, having maintained his own catalogue of Pinot Noir importations, along with notes on each clone’s viticultural and winemaking performance. New Zealand winemakers at the top of their game are already producing Pinot Noir in which 2 + 2 = 5. But, then, I suspect that Mr Kramer knows this very well and simply wished to spark a new conversation about a very old grape. Riversun Nursery has, in the past, contracted my freelance communications services for many of its publications, including ghost-writing for “The Pinot Noir Portfolio” and the other guides in this series. In the case of this post, I am not writing for payment – simply presenting my own opinions on a subject dear to my heart. My late husband, Dr Roderick Bonfiglioli, played an instrumental role in Riversun’s vine importation programme, sourcing new clones and selections from many countries, including those from ENTAV in France. I am a team member of and provide communications support to New Zealand Winegrowers Virus Elimination Project, which has as its long-term goal the containment and control of Leafroll 3 in this country’s vineyards. This project, too, was conceived by “Dr Rod,” whose work on behalf of the wine industry continues to be honoured by the “Rod Bonfiglioli Memorial Scholarship,” which is funded by New Zealand Winegrowers. Posted in Clonal selection. Bookmark the permalink. Post a comment or leave a trackback: Trackback URL. Would be interesting to compare prices for some of the “5″ Burgundies and compare to those “4″ wines found in New Zealand – New Zealand is leading at providing stellar value at the higher end of the market. Kramer did a good job in saying “well done” in a subtle way and suggesting where some interesting adjustments might yield exponential results. Yes, and as Tim Atkin noted on Twitter, there are already examples of New Zealand Pinot Noir making 2 + 2 = 5 (at considerably lower prices than their Burgundy counterparts). Atkin cited the 2010 Bell Hill and Felton Calvert, but there are others – all making superb wines (despite their “clonal deficit”). It is possible to import new vine material as I have done for St Laurent using tissue cultures rather than cuttings. This reduces the quarantine period to 6 months, and there are many facilities to receive tissue culture such as Blue Mountain Nurseries. The limitation is there are only three approved facilities to import material from: UC Davis, MAF Canada and Switzerland. Thanks for that, Paul. Tissue culture is the way of the future for all vine importations, but, as you mention, New Zealand will only accept importations from accredited, low-risk suppliers for the shorter timeframe to importation. Otherwise, vines and/or tissue cultures have to go into a Level 3 post-entry quarantine facility, and then it’s the lengthy testing regime that adds on the time.